Why did Magik emerge from her experience as part of the Phoenix Five unscathed–and perhaps more powerful than ever–while her teammates found their mutant gifts twisted? 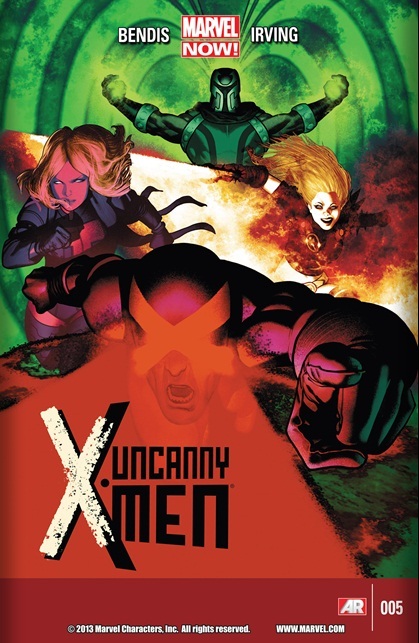 Cover– The standard cover has a very distinctive style illustrating Cyclops leading a charge straight ahead optic blasts flaring while Emma tails in diamond form, Magic behind her soul sword blazing and Magneto floats in the background. I like it. Art- Frazer Irving’s art looks great on all pages, especially the scenes between Magik and Dormamu. Students- So we have our first batch of students; step ford girls, Young Angel, Chris etc. We get some cool interactions between the students and they provide some humor to offset the more somber tone of the book. Consequences– So Avengers vs X-men continues to haunt the “would be” remaining Utopia based X-men and former extinction team. Illyana is affected by the broken powers differently because her powers are not simply mutant based but also tinged with magic, the same problem that makes the scarlet Witch so dangerous. While she seems to have access to far more power as the Avengers Vs X-men event she has also apparently lost complete control of her demonic side. Dormamu also states that her damaged powers are not just affecting Limbo adversely but are also ripping his world apart……interesting……is she now accessing magic outside of the limbo dimension? Black Heroes- Nick Fury jr makes an appearance and new mutant Chris. Emma Frost- There is a moment between Emma, the Step fords and Chris that seems out of character for her considering all the things she taught the step fords all these years. Art- Some people will be put off by the art, some portions were a bit chaotic. Black Hero- It’s cool Chris is getting the spotlight but does he have to constantly be the bud of all the jokes?